When faith is illegal, what do you do? In 2030, Zach Thomson hatches a plan to bring back the freedom to be a Christian. In the year 2030, all religious freedoms Americans once enjoyed have disappeared, replaced by a universal church in which Christianity is outlawed. The government silences all truth and views those who dare to speak about their faith as terrorists who must be hunted down and destroyed. Only one man, Zach Thompson, has the courage to stand up for the truth. With the help of his friend Aaron, a Navy Seal with expert computer skills, Zach devises a plan to breach the government's lockdown on religious webcasts, but Zach's proclamation of faith comes with a heavy price. Imprisoned by a ruthless government official, Captain Jack Johansen, Zach stays focused on his mission, even with death pounding at his door. 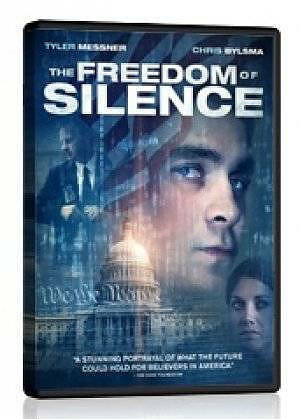 The Freedom of Silence DVD was published by Bridgestone Multimedia in April 2013 and is our 13587th best seller. The ISBN for The Freedom of Silence DVD is 095163885380. Be the first to review The Freedom of Silence DVD! Got a question? No problem! Just click here to ask us about The Freedom of Silence DVD.